A sliced Carrot looks like the human eye. According to science, eating carrots greatly enhances blood flow to the eyes. Carrot gets their orange color from a plant chemical called beta-carotene, which reduces the risk of developing cataracts. The chemical also protects against macular degeneration an age-related sight problem that affects one in four individuals over the age of 65. If one tries to pop a pill of beta-carotene it doesn’t have the same effect, says scientists at John Hopkins Hospital in Baltimore, USA. A Tomato has four chambers and is red in color, so also the heart is red and has four chambers. Research has confirmed that tomatoes are loaded with lycopine and it is indeed pure heart and blood food. Grapes resembles the alveoli of the lungs. The lungs are made of branches of ever-smaller airways that finish up with tiny branches of tissue called alveoli. These structures allow oxygen to pass from the lungs to the blood stream. A diet high in fresh grapes has shown to reduce the risk of lung cancer and emphysema. Grape seeds also contain a chemical called proanthocyanidin, which is thought to reduce the severity of asthma triggered by allergy. One reason that premature babies struggle to survive is that, these alveoli do not begin to form until 23 to 24 week of pregnancy. A Walnut looks like a little brain, a left and right hemisphere, upper cerebrums and lower cerebellums. Even the wrinkles or folds on the nut are similar to those of the neo-cortex. Scientists claim that walnuts help in developing over three dozen neuron-transmitters within the brain enhancing the signaling and encouraging new messaging link between the brain cells. Walnuts help warding off dementia. They also extract and break down the protein based plaques associated with Alzheimer’s diseases, according to a study by Dr. James Joseph of Tuft University in Boston. Olives assist the health and function of the ovaries. An Italian study found that women whose diets included a lot of olive oil had a 30% lower risk of ovarian cancer. The reasons are unclear, but the healthy fats in the oil may help suppress genes predisposed to causing cancer. Eating a Banana will cheer you up and put a smile on your face. This popular fruit contains a protein called tryptophan, when digested it gets converted into a neurotransmitter called serotonin, which is a mood regulating chemical in the brain. 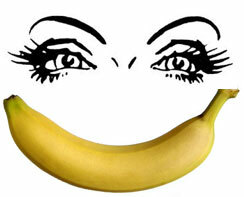 Banana can be termed as an antidepressant drug, since it adjusts the level of serotonin production in the brain. Ginseng root looks like a human body, and it is a holistic cure for nearly all ailments. I have never thought about it that way. That is so cool how a lot of the food looks like the body part it helps. I absolutely love this post. It is true and the pictures make it really clear.Thank you so much.